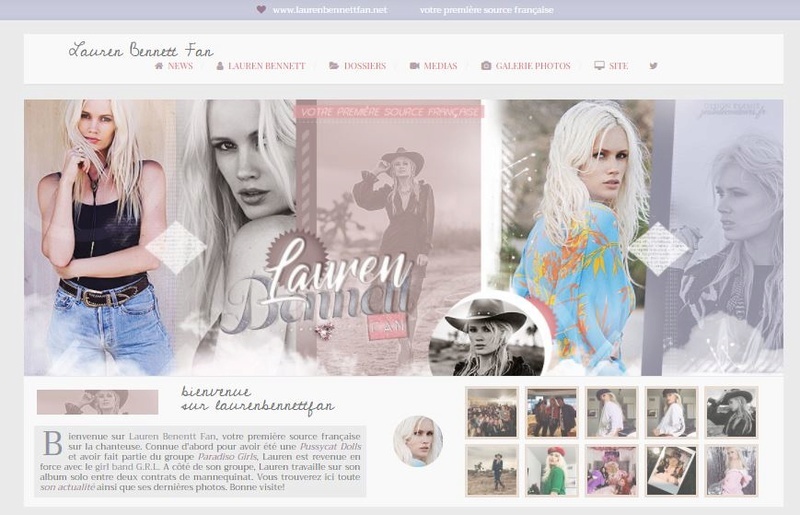 New layout on Lauren Bennett Fan, the french source about the singer Lauren Bennett! I have all the news and pictures about her everyday. If you want to visit me please check my website and affiliate with me: http://laurenbennettfan.net/. Thank you! Zoey Deutch Fan is open ! Hello everyone !! Zoey Deutch Fan is open. Your new french source about the amazing american actress Zoey Deutch. Check it out and let us know what you think. DEUTCH-ZOEY.COM. Follow us on twitter too @ZoeyDeutch_Fan. Hello, opened the hungarian fan site, Margot Robbie, with a beautiful australian actress, where you can find everything from your favorite hand. Hello, everyone! My name is Maria, and I would like to introduce you Estrella Design, your new source for graphic for WordPress, Coppermine, Twitter, and Facebook that starts its work on January, 1st 2018. Here, you can order a beautiful graphic for your sites and fan accounts on social networks. Although the site is mainly on English and Russian, any language is acceptable. The site is quite comfortable for a view and has a good mobile version that looks nice whichever device you use. I am making orders for free now, but there is a possibility that I may make future orders paid. If you like what I do for you, you can always donate as much money as you want — this is absolutely your wish. The site is currently looking for affiliates; so, if you want to affiliate, just check out the section “Affiliates” on the home page. And you can also find us on Twitter and Facebook. Also, you can check out my other site Aly & AJ Russia, if you are a fan of the musical duo Aly & AJ. Hope you enjoy this new site, love the works I have made and will visit us again. The new year is here, just like the new layout on the only Hungarian source of Imagine Dragons. 2017 was definitely the year of the American band, join the Believer family and let’s find out together what 2018 will bring to us. If you don’t want to miss any show of Evolve World Tour, make sure to stop by, and also check out the gallery, which has 5000+ pictures. See you on the website! Allison Williams Web has a new look! Allison Williams Web, your best source for everything Allison Williams has a new design. The header was created by the amazing Kaleidoscope3 and the theme is by MonicaNDesign. I really love this new look and I hope you all like it too. We are still accepting elite affiliates if you are interested please fill the form here or send us an email at allisonwilliamsweb@gmail.com. Welcome everyone to Gal Gadot Hungary, the biggest hungarian fan site on Gal, which opened on August 17, 2017 and moved to Flaunt.nu on November 1st. On December 28th, I got the g-gadot.net domain on December 28, so that’s where the site works. I wish you a good watch on the site. Elite Affiliates can contact ggadotnet@freemail.hu. You can access the gallery here.